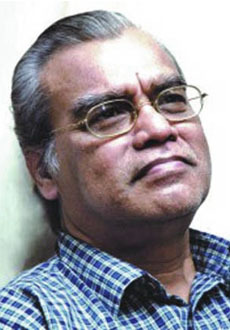 Abdullah Al Mamun was a renowned playwright, actor and filmmaker of Bangladesh. Mamun wrote his first stage play, Niyotir Parihas, in 1950. Subsequently, under the guidance of Muneir Chowdhury, he further developed his skills as a playwright, director and actor. He was associated with the then Pakistan Television (PTV), later renamed Bangladesh Television (BTV), from its very start in 1965. Mamun wrote 25 dramas and seven novels, an autobiography Amar Ami and a travelogue Manhattan. His literature mostly depicts the middle-class lifestyle of Bangladesh. Ekhono Kritadas, Tomari, Amader Sontanera, Kokilara, Bibisab, Meraj Fakirer Maa and Mayik Master are few of his popular plays. His another important drama was Doyeler Sansar based on the short story Doyeler Sansar written by Anirudha Alam broadcast by BTV. Mamun founded drama group Theatre (Bailey Road) and was an adviser to quarterly magazine Theatre. Plays produced by Mamun include Songsoptok, Pathar Somoy, Jibon Chhobi and Baba. Abdullah Al Mamun was also a filmmaker. He made his debut as a filmmaker with Angikar in 1972 and earned much critical acclaim for movies like Sareng Bou, released in 1978. His other acclaimed films include Ekhoni Somoy, Dui Jibon, Sokhi Tumi Kaar and Bihanga. Mamun served as deputy director general of BTV, director general of the National Institute of Mass Communication (Nimco) and director general of Bangladesh Shilpakala Academy. He won many awards including the prestigious Ekushey Padak, National Film Award and Bangla Academy Award.